At Pesakh, the Passover, it is traditional to read from a special book, the Haggadah, about the liberation of the slaves from Egypt. Each of us is commended to think as though we personally were among those liberated. Over the centuries there have been several Haggadot which gave the story contemporary meaning. 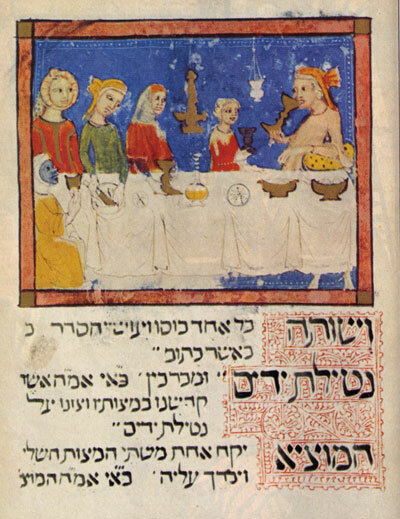 But a JSG member who went to Bosnia during the war there heard about one particular centuries-old Haggadah whose adventures have become a legend of its own. SEDER a la mode. Clothing styles suggest book's origin in 14th Century Barcelona. That's what I wrote in Jewish Socialist No.35 Spring 1996. The Sarajevo Haggadah is now on permanent display in a rebuilt museum. Sadly, the Haggadah's happy ending remains among isolated cases as yet, like the rebuilt bridge at Mostar. If only the damage to Bosnia and Hercegovina and its multicultural tradition by war and nationalism, the Dayton agreement's entrenching of ethnic divisions, and the carve up of a society by commercial carpet-baggers, could be as easily repaired. "Dayenu" -it would suffice! And since I wrote that, disturbances in Bosnia and Hercegovina, sparked off by protests over factory closures in Tuzla, where my story began, and spreading across boundaries, - with the graffito "Down with Nationalism" appearing - suggest a new generation of Bosnians want to put their country together again.